AFCON hosts, Gabon failed to make it past the groups stage despite the presence of star forward, Pierre Emerick Aubameyang. The player who plies his trade for Borussia Dortmund in the German Bundesliga duly hopped on a plane back to Europe following the exit. 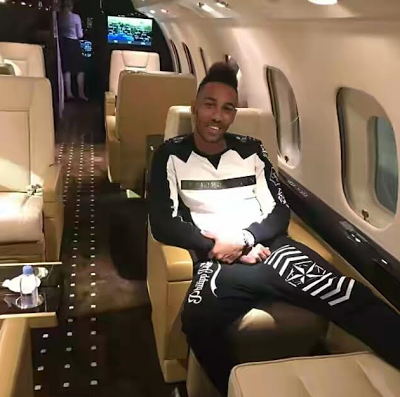 He shared a photo of himself in the luxurious surroundings of a private jet. 'On my way back to @bvb09 #aubameyang #pea17 #backontrack #bvb #phillipplein #pleinhero #allthewayup,' he wrote alongside the image. The player has been the subject of interest from some of Europe's biggest clubs including reigning champions Real Madrid and Dortmund chief, Hans-Joachim Watzke, says any bids approaching €80m will trigger negotiations.